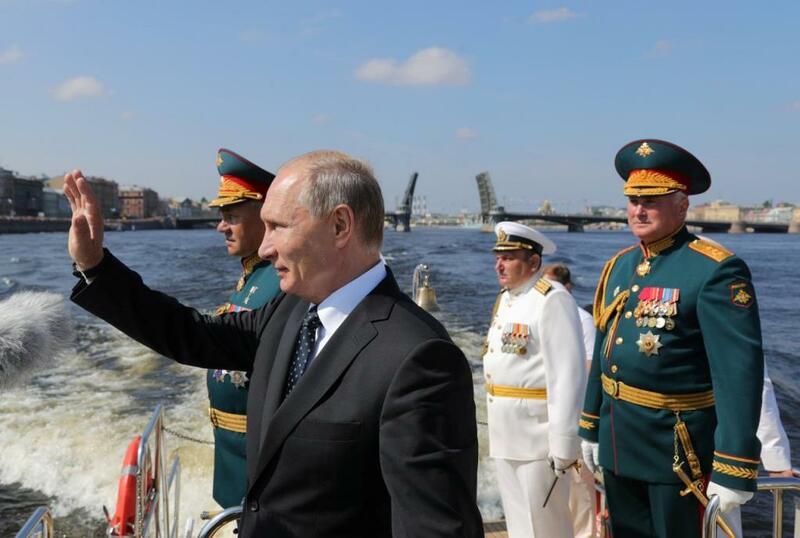 MOSCOW, Russia (BulgarianMilitary.com), 29 August 2018, Editor: Galina Zdravkova, Photo credit: Sputnik/Mikhail Klementyev/Kremlin via REUTERS/Russian President Vladimir Putin, Defence Minister Sergey Shoygu and Commander of Western military district Colonel-General Andrey Kartapolov attend the Navy Day parade in St. Petersburg, Russia 29th July 29 2018. The information was revealed by the Defence Minister at a meeting with reporters in the Republic of Khakassia, Siberia. About 300,000 service members and over 1000 aircraft (airplanes, helicopters, and unmanned air vehicles) will participate in the manoeuvres East-2018, which will be carried out from 11th to 15th September. Sergey Shoygu also commented that there have not been such large military exercises since 1981 when West-81 gathered the armies and navies of the Soviet Union and the Warsaw Pact countries. “Imagine 36,000 armoured vehicles – tanks, armoured personnel carriers and armoured infantry vehicles – moving and working simultaneously, and that all this, naturally, is being tested in conditions as close as possible to military ones,” said Shoygu. Dylan White, NATO Press Officer / Editor, stated that the Alliance will monitor the East-2018 exercise and added that the details concerning that process are classified ‘secret’. Dylan White also said that the military attaches in Moscow of the NATO countries have been invited to watch the exercise and this option is being considered by the the North Atlantic Alliance.